This is a large painting that tells its story with a modesty and loveliness that is appropriate to its theme. The subject is very familiar: the three Magi, or Three Kings as they were then understood, come to find the infant Jesus. In that meeting we see human power – either military, political and financial in the case of kings or scholarly in the case of Magi – willingly and fittingly humble itself at the feet of God incomprehensibly made man. The painter, Vincenzo Foppa, is now little known, although in his time he was a local celebrity in Milanese painting, before being eclipsed by the arrival of Leonardo. Foppa had mastered the early Renaissance skills of perspective and control of light, and we see him here committing those skills to tell the story. He uses simple linear perspective to lead the eye neatly through space from the large figures in the foreground to the small city in the background. He also uses aerial perspective, through which the strong colour of the foreground is gradually washed out to suggest the far distance. He retains the delightful Gothic love of detail as well, which would soon be displaced by the generalizing idealism of the High Renaissance. The setting of the event is typical of such scenes: at the left-hand side are the cattle, above whom we see the timbers of a ‘stable’. Alongside it the smart classical architecture evokes the Roman period. Its brokenness references its historicity, and possibly also the fact that, with the birth of Jesus, a new era is beginning. From the top right a serpentine line of figures comes down the hill. Probably these are intended to be the same group that we see in the foreground: it was still acceptable at this time to show two separate scenes in the same image. By implication the road leads down to the winding line of figures emerging round the column in the foreground. The procession of foreground figures then brings us forwards and downwards to kneel at the feet of Jesus. Mary and Jesus are not in the centre. As Rubens would do a century and a half later in his famous version of this scene, Foppa has placed them in the front corner. When the main character is not in the centre, you know something is up. Placing Jesus in the corner echoes his displacement from his throne in heaven to take on our humanity. And with this composition, also, the eye follows the line of kings and servants, mimicking the idea of a journey that leads us to Christ. Then, as the eye draws near, the three kings progressively lower themselves. One, looking very splendid in his white gown and bejeweled yellow collar and exotic turban and crown, stands waiting with his gift, while a servant unbuckles his master’s spurs. This king catches our eye and indicates with his pointing finger the direction we should look: to the baby who is the King of Kings. The next king is actually the centre of the painting and perhaps conveys the central message to the viewer: do what I am doing. His crown as yet is on his head, but he is in the act of reducing himself to kneel before Jesus. He is opening his gift, in order to offer it up. The third is already on his knees. He has removed his crown, which is held by the attendant standing beyond the group. Joseph has already received the king’s gift. Now, gently, this king touches the infant’s feet as he guides himself towards kissing them. In the background, calm and peaceful and hopeful stands Jerusalem on the hill, the capital city where the ‘kings’ understandably went looking first for the King of Kings. But in the foreground is the reality of Jesus, who humbled himself to become one of his own creatures, to be born in a stable, laid in a manger, parented by ordinary folk. But who is rightly worshipped by kings and wise people everywhere. And look at Jesus. Artists have always struggled with how to present the true nature of Jesus in images of him as an infant. He is human and divine. But how do you bring out in a painting of a tiny child that he is also the almighty God through whom all things were made? Some simply image him as a tiny, frail baby. Others, like Foppa, show him physically as a baby, but acting like a grown-up. Jesus here, as a small baby, needs to be physically supported by his mother. But he himself opens his arms to receive the kneeling king. It is a wonderful gesture of great-hearted acceptance and loving embrace. As Jesus will say later: ‘All those the Father gives me will come to me, and whoever comes to me I will never drive away’ (John 6:37). At Christmas we traditionally welcome the infant Jesus. But how much more does he long for us to come to him, so that he can embrace us. 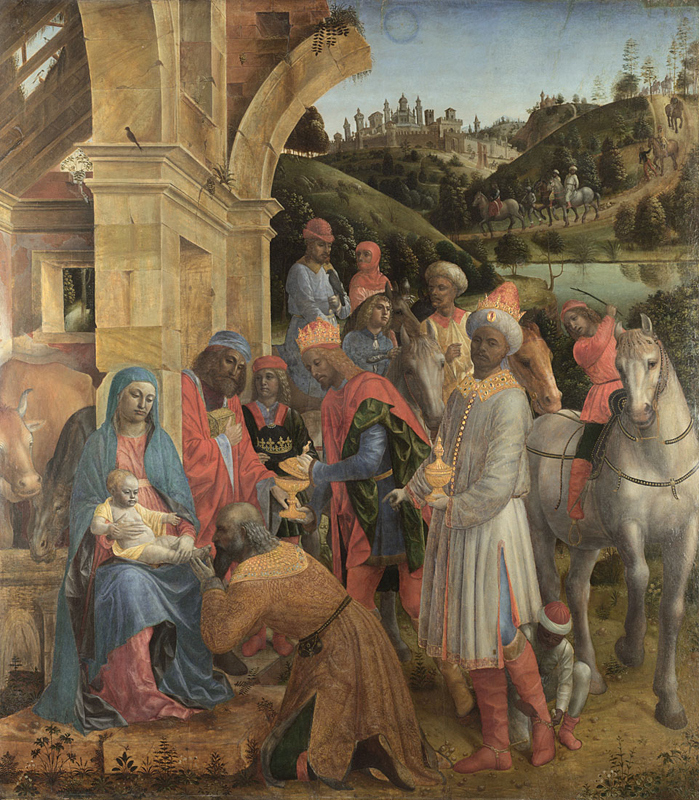 Vincenzo Foppa: The Adoration of the Kings, c.1500, oil on poplar, 239 x 211 cm. National Gallery, London, England. Vincenzo Foppa (c. 1430 – c. 1515) was born near Brescia in the Republic of Venice. His training as a painter may have been in nearby Padua, which would account for similarities in his work both to that of Mantegna and that of Crivelli. He moved to Pavia c. 1456 to work for the Duke of Milan and became one of the leading painters of the region before the arrival of Leonardo. He returned to Brescia in 1489.